Crescent Moon Collective: Yarn ends for the birds! and, they are back! I feed the birds in several feeders in my frond yard and back yard. The usual visitors include house finches, sparrows, black capped chickadees, a pair of northern flickers and a downy woodpecker or two. 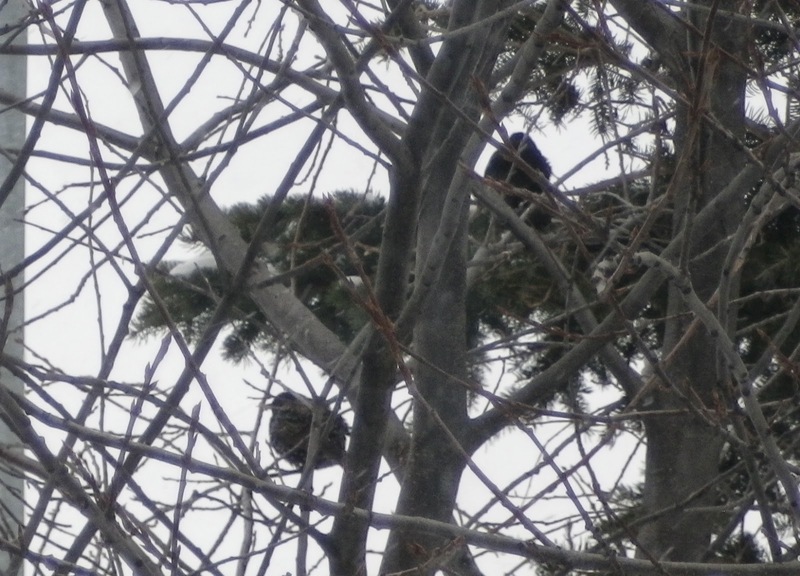 There are also magpies, a couple of pigeons and a raven that stop by now and then. Sometimes there is a squirrel, and always there are rabbits. Yesterday, emac noticed something bigger, so I quickly looked out, thinking maybe it was a robin ( I have been waiting for them) but now, it was something else. Something kinda fat with a short tail and speckles, definately not a robin. We took some quick as possible and not really very good pictures and I looked at www.birdscalgary.com ( my first choice for bird info).There he was a European Starling. I saw two yesterday and again today. This afternoon another visitor, and this time it is a robin. I saw him first and have to admit jumping about singing A Robin, A Robin, I see a Robin. Well, it is quite special, the first robin of spring. 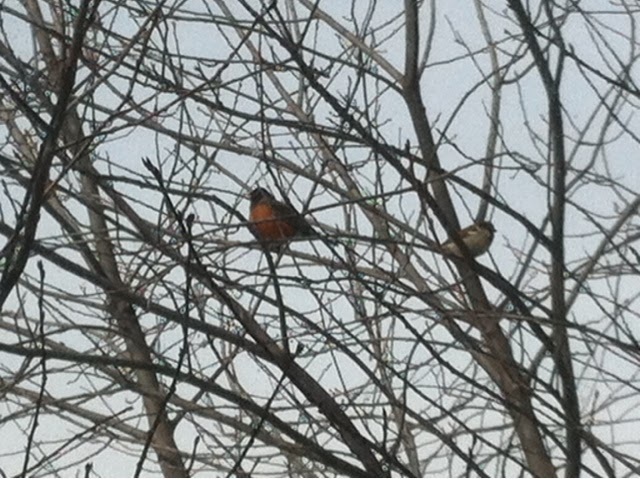 Even though it has been snowing all week, the robin is back in my tree. All winter, I have been saving the cut off ends of yarn for the birds, and now and then hanging them out side on the little tree by the front door. Its a bit of colour in the winter, not quite an actual decoration, but something to catch your eye. 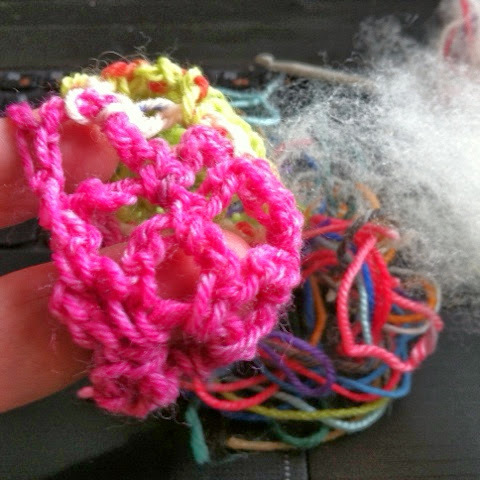 I tell myself the birds will use these bits of yarn in their nests, and think to myself that maybe I will see some colourful birds nests in the spring and summer. Last week, I saw this very cool blog post about something similar, only much better than just hanging the yarn on the tree. This post includes pictures of an Alpaca Nesting Ball and this DIY Guide shows hot to make a Grape Vine Ball for nesting birds. 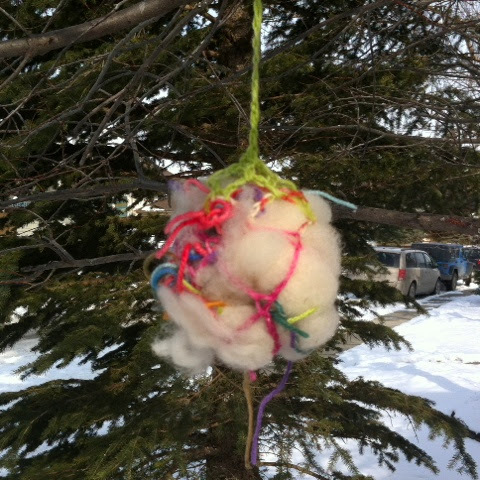 And here it is, stuffed, and hanging on the tree where I can see if the birds are interested in it at all. 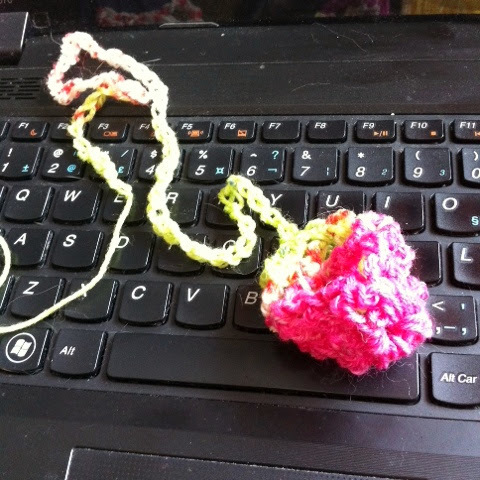 If I was a bird, I think I would love to line my nest with pretty colours and soft warm woolly fluff! I am sure my neighbors will be wondering whats hanging on that tree now! I will have to get a picture of the little house finches. They are so pretty now, the males have their pretty red feathers. In the meantime I am listening to them sing and chirp, making me sure spring must be on the way.